Have you ever skipped a badly written fight scene to get back to the main story? I have, and I never missed it. That’s because although fight scenes are often critical to the plot, once the blows start flying, two things often happen. Writer #1 includes too little detail and there’s no tension. We don’t know who the characters are or why they’re fighting. As a result, we don’t care about the logistics of the fight, just the outcome. Writer #2 throws in every detail. We swim in a sea of wailing fists and disjointed limbs. In the waves of words we lose track of who did what to whom. We either back track and try to find our place, or skim ahead looking for something to reorient us in the story. Recently I wrote a sword fight. It was a nightmare. I took fencing in school and my husband and niece are both skilled with a blade. I wasn’t too worried about my ability to handle this weapon on paper. Boy did I overestimate the value of life skills! My first draft read like a textbook, no passion. The second draft read like a deranged killer wrote it. There was too much blood lust. Many valuable lessons were learned, and now my two characters fight in a way that (hopefully) isn’t going to send my readers away yawning, or clutching their stomachs. Prefight prep: Every fight is the product of earlier story events. 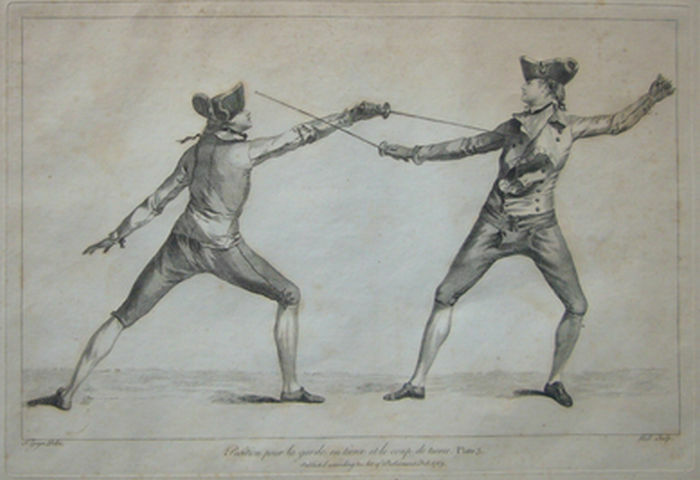 A fight reads better if the combatants know each other (or know about each other) beforehand. The reader also needs a clear idea of the fight’s stakes. Sprinkle the seeds of the conflict around and build a foundation for how the conflict affects your key characters. If the conflict takes place in a special place or with unique weapons, try to familiarize your reader with these facts before the fighting starts. Characters that stay true to form: If your character is always a bit of an idiot under pressure, use that trait. Show him falter at a critical time or use a defining battle moment as a catalyst for change. A character who is naturally brave can also experience change; let them face confusion or doubt. However, don’t take this too far. Try to keep every character genuine and believable. A critical pause: Find the calm inside the storm or make one happen with creative storytelling. There are a number of ways to create a pause: you can distance one character from the action, or you can slow time for one character as they lay wounded. Use the pause to give the scene fresh perspective. Reinforce the stakes, or give the story a reversal or plot twist. The action within the pause should hold significance to the story. Short sentences and simple language: Make the language work with the fight, not against it. Since fights are notoriously hard to write and hard to read, don’t layer on complicated passages and extra jargon. If your character always fights with a haladie, a twin bladed dagger, you need to use the word haladie. If you followed the prefight plan, your reader will already know what this weapon looks like and how it moves in a fight. Create a condensed version of the fight: Don’t make my mistake and include every single lunge and parry. Use enough detail to bring the scene to life and make it exciting. Don’t be afraid of summarizing the big picture of a battle and give the critical moments of smaller actions more details and page time. Following the fight from the POV of only one character can be incredibly helpful. A workable setting: Think about how much (or how little) space the characters need to move around. Consider the climate or landscape. Is it pouring rain or snowing? Every environmental condition has dynamic advantages and disadvantages. What natural barricades, ambush positions or makeshift weapons might your characters find in that setting? Put your setting to full use. Maybe something memorable will happen. Decide if it’s a fair or unfair fight: Even fights and fighters have rules. Try to know where a character’s limits are. Would they kill in cold blood? Or would they spare a fallen foe? Is the end goal too important to let their ethics stand in the way of victory? Would they take a hostage? It’s easy to create unfavorable impressions of a character, even a hero, when you drastically change their moral code without reasons. Keep the comic fighting in the movies: We love watching comic fights! But reading them is not as fun. Some writers can pull off being funny in armed conflicts, but they are a rare group. If you’ve always wanted to write comedy, a fight scene is not the best place to start. I know it’s tempting to throw in a gag or two. A fight is so serious, you want something to lift the mood, but comedy often backfires. Stick to watching comic fights on the big and small screen. Any Pirates of the Caribbean movie will do, but this one is a favorite. 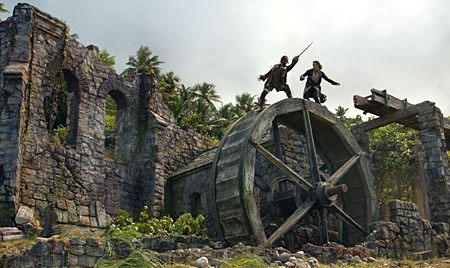 Pirates of the Caribbean: Dead Man’s Chest: The waterwheel fight is fantastically funny. Don’t forget to talk: People communicate in fights, even in battles. But use dialogue wisely. Keep it terse and focused on the scene. Characters shouldn’t stop mid-battle and give a speech, the time for monologues is before the fight starts, or after it’s over. Think about the moments fighters might talk. To recap a plan. To encourage the other fighters. To plead for surrender. Or beg mercy. Research real life fight mechanics: It’s hard to see real fighting in action, and I don’t condone starting a fight to gather experience. But you can take some lessons in kick boxing or archery. You can watch videos of an expert shooting a hand gun, or read about knife fighting techniques. The more you know about the physics of weapons and fighting, the more dramatic impact you can bring to the page. Book fights don’t enjoy the visual advantages of films, and they’re challenging to get right. It’s easy for a writer to get lost in them. Hopeful some of these tips will help. If you’ve written a fight scene, please share your tips in the comments. I’m sure we can all use the extra help. Or if you’re a writer struggling with a fight scene, post your problem in the comments. With a team effort we might be able to find you a solution. Writing a good fight scene has some of the same characteristics as writing a good love scene – although hopefully it’s not the hero and heroine battling with the haladie. There must be a reason for the fight/love scene. It must carry the story forward. (Love/fight scenes just used for titillation are a waste of space and probably better reserved for a different genre.) And, they are also both excellent opportunities to showcase character motivations and help move the story forward. You’re right, Robin. Definitely some chemistry between those two! Love that movie. I love writing fighting scenes, usually with many characters, but it’s hell to doit in any workable way. Usually, I rewrite these scene many many times. Thanks! I agree, writing a fight can be fun! And I think any fight worth reading has been reworked a number of times. They take a high level of commitment. You are a brave writer. I find working with lots of characters in a fight scene super challenging. I’m mostly writing “average” characters and scientists, so I try to remember that the “fight scene” as such really won’t happen. Any physical altercations will be very short and totally unexpected for the characters. There are some artsy “sparring” scenes that mostly involve futuristic weapons, and I have one Magical Space Martial Arts expert who can have some longer engagements, but mostly we’re talking “occasional acts of violence” rather than stylized fight scenes. It’s a different animal. I think you’ll find prefight prep is really helpful for your futuristic weapons. It’s going to be more interesting to your readers if they understand how these items work and what it takes to handle them successfully. Also even some light sparring can be a blocking nightmare. Pay attention to the setting and try to take into account what objects the characters might encounter during the fight. Magical space martial arts battles sound fun! I would add, keep inner dialogue to a minimum. Usually in a fight your mind’s spinning, adrenaline surges through your body. There isn’t time to rationally think things through. I’m sure you did a wonderful job with your scene, Robin. Great point, Sue. In a real fight you don’t think the same way you do under normal conditions. It’s about reacting to the events around you. Haha. The waterwheel fight is my favourite. Great tips. Will have to use them in my pirate fight. Loved your new short story on the Writing Room 101. Thanks for the tips. Fight scenes are always tough for me to write. I can usually picture it in my head pretty well but translating that to words proves tricky. If you find creating the visuals in your head super easy, you might want to try blocking the scene in story boards. Most writers don’t like to make maps or create blueprints of fictional rooms, but I need them! Even if the story board is just stick figures, it’s super helpful for me when I’m planning out where every character is during the fight. Tricks and tips are great, but it’s still no picnic writing a fight. Good luck with yours. I’m glad you liked #5. : ) #10 is a must, just don’t make my mistake. You can overdo the realistic details. If you want me to beta read let me know. Great stuff! Usually you need a few drafts of a fight scene to see it play out well, so don’t be afraid to do that. I need a few drafts for everything! I envy those that don’t. : ) I my case fights take more planning. I need to block out the moves story board style so I can visualize the space. I thought about including that as a tip, but often when I talk about story boarding to other writers their eyes just glaze over.